IndIPEN or The Indian Interprofessional Education Network is a collaborative initiative of Manipal-FAIMER Institute for Leadership in Interprofessional Education (M-FIILIPE) with AHPE (Academy of Health Professions Educators), India. Dr AM Ciraj heads this initiative. More details can be found here. 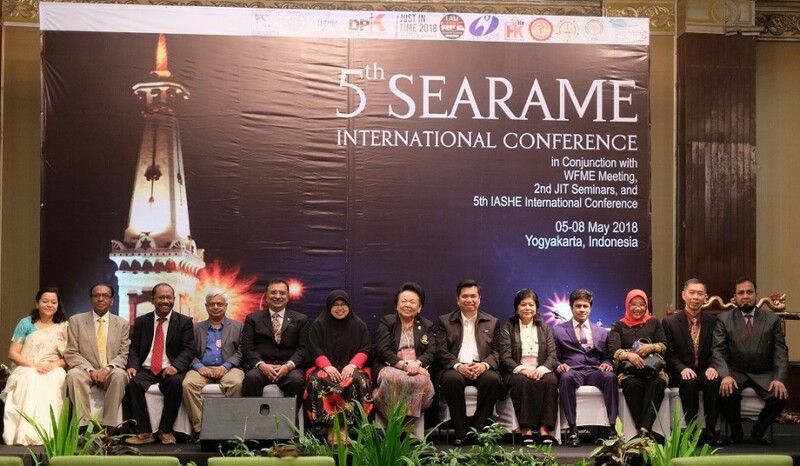 AHPE India participated in the 5th SEARAME Conference in Yogyakarta, Indonesia from 5-8 May 2018. In the Pre-Conference Workshop on May 6th, 2018, Prof Dr Thomas V Chacko, Past President AHPE India conducted a workshop on “Academic Leadership for improving Health Professionals Education for ensuring better health care. During the plenary sessions of the SEARAME conference, AHPE President Dr. Himanshu Pandya spoke on “Experiences about National Licencing Exams: India” and AHPE past President Dr. Thomas V Chacko spoke on “Efforts to improve health services in Southeast Asian Countries: Challenges” and also shared experiences from India during a symposium on ‘Improving quality of HPE for better future health services: SEARAME Experiences’. During the Conference, the Executive Committees of WFME (World Federation for Medical Education) and SEARAME (South East Asia Regional Association for Medical Education) met to deliberate on matters relating to improvement in the quality of medical education in their respective areas.